Service providers rely on external suppliers to provide elements of the service provided to the business. Failure of a supplier to deliver may mean that the service provider fails to achieve the service level targets agreed with the business. A number of factors, from the nature of the service to the overall cost, determine the importance of a supplier from a business perspective. 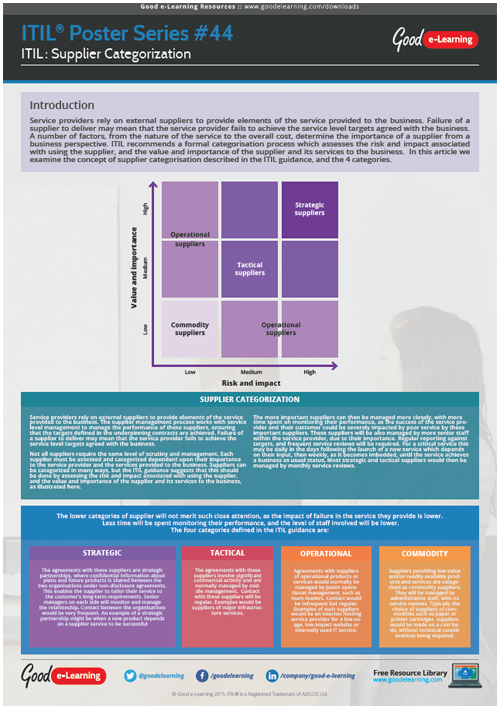 ITIL recommends a formal categorisation process which assesses the risk and impact associated with using the supplier, and the value and importance of the supplier and its services to the business. In this article we examine the concept of supplier categorization described in the ITIL guidance, and the 4 categories.